Mary Elizabeth Johnson was born on February 6, 1943 in Corinth, Mississippi. Her father was a policeman and her mother worked at home as the registrar of births and deaths for the county. Mary expressed her musical gift at a very early age. 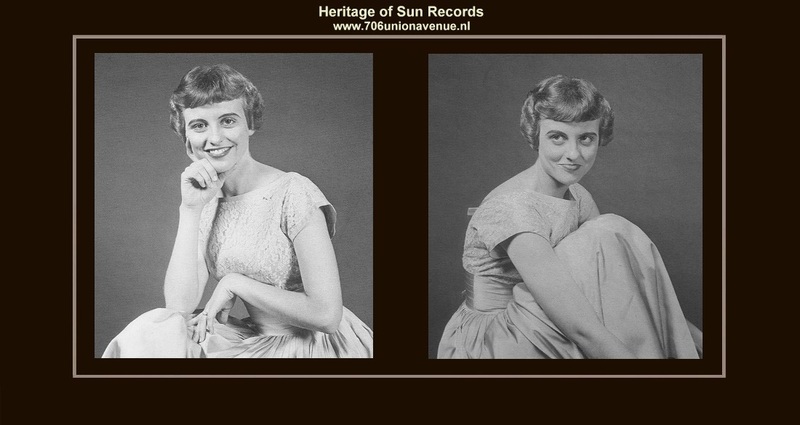 In early 1956 she recorded for Sun Records, but no tapes were released. Not surprisingly, given her talent, Mary found her way to Nashville and beyond. In 1957 she and a friend sang at local Corinth event. The performance was witnessed by steel guitar player Royce Littlebrook, who asked if she'd like to record. Mary Johnson recalled: "I said 'Of course I would!'. Royce then talked to James Joyner and Kelso Herston, who had recently started a small record company in Florence, Alabama. They came to hear me at my home and decided to sign me. Mother and daddy went over the contract for me - I was only about 14 - and signed it. We tried to record but James and Kelso never could get their equipment working right, so they decided to take me to Nashville. They had a connection with Buddy Killen at Tree Music, who worked out a deal with Chet Atkins at RCA Victor. I think Buddy was really blown away when he heard me and saw how young I was. He went ahead and got us an appointment with Chet and I think Chet, too, was pretty impressed. It wasn't long after that I had my first session for RCA". By this time, Mary's name had evolved into Jeanie Johnson, which is how it appeared on her first three releases for RCA - all produced by Chet Atkins. The first single was cut on January 12, 1958, just before Jeanie/Mary's 15th birthday. Another session was held on April 29, 1958. Her third single, cut on May 21, 1960 was released with a picture sleeve, underscoring how highly RCA regarded the young singer. After this contract expired, Mary resigned with RCA in 1965. Her next two singles were produced by Felton Jarvis and credited to Jeanie Fortune - another name change. "Occasional Tears" (RCA 47-8704) was released in 1965 and her final disc for the label, "Angry Eyes" (47-8914), appeared in 1966. Another single, "Sure As Sin", appeared on Atco 6619 in 1968. It remains one of Mary's favourites. During her tenure at RCA, Jeanie met and married singer-songwriter Marlin Greene. While she continued to record as a solo artist, Johnson was also singing with Mary Holladay and Susan Coleman in a group they named Southern Comfort. Donna Thatcher was added later to bring further depth to the group. The group wanted a fuller four-part sound like The Sweet Inspirations. When Donna left the group, there skated using Ginger Holladay, Mary's sister. Their tight and spontaneous harmonies were valued for studio work in the burgeoning southern recording industry and soon Johnson/Fortune/Greene was in demand as a regular backup singer at Chips Moman's American Sound Studio in Memphis, as well as Fame Studios and Muscle Shoals Sound in Florence, Alabama. Mary Johnson also worked regularly as a backup singer at Stax and Hi Records in Memphis, and several studios in Nashville. Mary recalls: "One of the first backup vocal jobs I had was behind Jerry Lee Lewis at Sun in Memphis". The session, held in August 1963, was the singer's last for the Sun label. In addition to session work as backup vocalists, Southern Comfort recorded material under their own name for Cotilion Records. When in the early 1970s, Ian Matthews' hit "Southern Comfort" came out, The Southern Comfort changed the name because the hit record decided who got to use the name. Mary Johnson's work appears anonymously on a host of Elvis Presley records recorded during the 1960s. "The first session we ever did with Elvis was "In The Ghetto", recalls Mary Johnson. "That was at American Sound. We also did "Suspicious Minds". We never did appear with him on his stage shows. They used The Sweet Inspirations instead because they were quite a draw in person. I originally got the job singing backup for Elvis because of my recording for RCA. Felton Jarvis, who was Elvis's producer, handled my last session at RCA''.
'' Some time later we had done some work at American Sound and I found out that Elvis was coming in. I remember we spent the night at the Holiday Inn on the river after our session and the next morning as we were checking out I called Felton. That's the boldest thing I think I ever did in my life. I said to him, 'We just found out from Chips that you're bringing Elvis in for a session and we really want to be on it'. He said, 'Well, I'll talk to Elvis about it' and sure enough we got to do it. We almost fainted". Mary's group, The Southern Comfort, also recorded widely (and performed live with) Neil Diamond. They were seen with Diamond when he appeared on the Johnny Cash TV show. As her original Sun recordings suggested, Johnson was not restricted by musical categories. Her vocal group also appeared on recordings with country artist Bobby Bare, and soul singer Percy Sledge (When A Man Loves A Woman), Joe Tex and Joe Simon. In 1972 Mary Johnson appeared with Marlin Greene on George Harrison's landmark Concert For Bangladesh album. Mary's group also appeared on 1960s albums by Boz Scaggs and Cher; 1970s albums by Don Nix, Albert King, Lonnie Mack, Gerry Goffin, Dan Penn, Willie Nelson, Leo Sayer and Peter Yarrow. In 1971 Mary again recorded solo, producing an LP on Elektra called "Mary Called Jeanie Greene" (EKS 74103). A live recording of an tour called "The Alabama State Troupers" was issued on Elektra 75002 in 1972, featuring Jeanie, Don Nix, and blues singer Furry Lewis. In 1984, Mary recorded as backup singer for Carl Perkins, but she never did get paid for it. After that, things began to wind down. In 1993 her husband Max died, Today Mary-Elizabeth-Jeanie Johnson-Greene-Lee lives in Corinth, Mississippi, not far from where she grew up. She lives a quiet life enjoying none of the material benefits or notoriety one might expect from such as a productive career in the music business. She is not looking for international fame and fortune, but neither was she expecting to be forgotten. Her voice, has graced numerous gold and platina records. She has been heard by millions who never knew who she was. Jeanie Green has recently been tranferred to Shepherd's Cove (Hospice of Marshall County) in Albertville, Alabama. Among her assorted afflictions, congestive heart failure has taken the biggest toll on her body. The doctors have not been optimistic that her condition will omprove - as heart will continue to become progressively weaker. Jeanie Greene passed away on August 19, 2018. Interview by D.R. Storm and Recorded Thursday December 30, 2010. ''Over the years Jeanie has told me some amazing stories about her career as a backup singer during the 1960's and 1970's. I have been wanting to put together a project like this for many years, but it just never seemed to come together until now''. ''I met Jeanie five or six years ago through a cousin of mine who has been a dear and close friend of hers since the 1960's. We began talking about family, and since her maiden name was Johnson, and since my family descended from a long line of Johnson's in Alabama - some of which moved into Mississippi where Jeanie now lives, we feel pretty certain that there may actually be a family connection between us, but we can't be certain since we haven't actually researched it''. ''Jeanie and I hit off right from the start, and have been the closest of friends since, which is one of the reasons I have come to affectionately call her "Aunt Jeanie". ''Jeanie has spent the last four Christmases with our family. We filmed this the day before New Years Eve last year. We talked all day, and I could of talked all through the night I think, but she was getting tired towards the end, but there were so many good stories, it was hard for me to find a stopping point''. ''This is my tribute to her as a person with a beautiful Christian soul, and as an often overlooked, and unsung musical talent. Some may say, "Who is Jeanie Greene?". What many don't realize, is that they have heard her, but not actually realized it''. ''This is part one of three parts. All together they total a little over an hour. I tried to condense it down to as much as possible, but there was just so much good footage that was captured that it would have been a cardinal sin to leave it out''. ''The musical snippets used throughout the interview are from various points in her career, mainly from her solo album she created back in 1971 entitled "Mary Called Jeanie Greene" which is available on CD from Amazon.com. This has certainly been a labor of love and I hope you enjoy it'', says Storm. Copyrights, Interview and Film by D.R. Storm, December 2010. This tracks will, of course, be a complete surprise to Sun collectors. Only a scrap of address in Corinth, Mississippi offers any clue about Ms. Johnson. The reverb suggest that the recording might have been mate at 706 Union rather than submitted as a home demo. This is the only gospel material on Johnson's tape. All her other material is quite secular. It deserved no less after spending nearly a half century in a dusty tape box. There also decided to try one more time to find out who the singer was and what she had done with her life before disappearing. This time we succeeded, and what we found was a much bigger story than any of us anticipated. Mary Johnson filled the house with music to the delight of her family. Some time in 1956, the Johnsons decided it wasn't enough to listen to her performing live in the living room. They wanted to have a record of her music. And so off to the Memphis Recording Service they went, making the 45-minute drive to that small studio on Union Avenue where - despite the growing success of the Sun label - you could still walk in off the street and make a record for your own use. $3 for one side. $5 for a two-sided 10-inch disc. Mary had just celebrated her 13th birthday. She sat herself down at the piano and went through a small portion of her repertoire. She began with her favorite song, the theme from "River Of No Return", a 1954 movie wih Marilyn Monroe that had thrilled her romantic soul. She then launched into Duke Ellington's 1931 tune "Mood Indigo". Then turning her attention to country music, she completed a brief version of Hank Williams' "Your Cheatin' Heart". Finally, she turned to a gospel tune called "My Heart Is A Chapel". And then she was done. Four tunes in barely ten minutes. Four unself-conscious performances in styles ranging from pop to country to jazz to gospel. Her piano work was rudimentary, but her vocals revealed a confidence and ability way beyond her years. The Johnsons paid their money, packed up their discs and drove back to Corinth. The story might have ended there except Jack Clement, who had recently gone to work for Sam Phillips, decided that this bright-eyed youngster from across the state line had something. Rather than recycling the tape, as was customary, Clement stored it away in a carefully marked box. Perhaps Sam Phillips listened to it at some points; perhaps he never did. In any case, the dust on the tape box probably hadn't been disturbed for 44 years when we carried it up to the studio and sampled the tracks. This track may be too easily discounted. Repeated listening reveals a surprisingly effective vocal with plenty of fratted thirds (blue notes) and effective phrasing. The song is probably an original by the singer/pianist and, with her, has disappeared into the mists of time. Pop/gospel music like this was probably widely performed in informal social (maybe even church social) settings but almost never recorded. As such, this brief demo gives us a glimpse into a bygone era.